The bark of the woody plants Eucommia ulmoides Oliv. of family Cortex Eucommiae. Mainly produced in Guizhou, Sichuan and Shaanxi provinces in China. Peeled the bark from April to June. Large, thick, the rough cover removed, black purple inner side and many threads in cross section. Sweet, warm; kidney and liver meridians entered. Tonify liver and kidney, strengthen tendons and bones, and prevent abortion. It is an important herb for soreness and pain in lumbar and knees, atrophy-flaccidity and limpness of lower limbs caused by deficiency of liver and kidney, because it can tonify liver and kidney, strengthen tendons and bones. It could be used singly or combined with other herbs to tonify liver and kidney, strengthen tendons and bones, for instance, it is used with Hu Tao Rou and Bu Gu Zhi in the formula Qing E Wan from He Ji Ju Fang. For wind-cold attacking for a long time, deficiency of liver and kidney, soreness and pain in lumbar and knees, difficulty in bending and stretching of limbs, atrophy-flaccidity and limpness of limbs, it is combined with herbs of dispelling wind-cold, tonifying liver and kidney, strengthening tendons and bones. For instance, it is used with Du Huo, Sang Ji Sheng, Shu Di Huang and Niu Xi in the formula Du Huo Ji Sheng Tang from Qian Jin Fang. 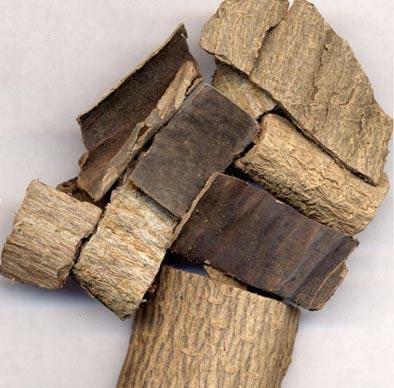 In addition, it is indicated for impotence, seminal emission, spermatorrhea, enuresis and frequent urination due to kidney yang deficieny, but these symptoms are not its first indications, therefore, it needs to be combined with kidney yang-tonifying and essence-nourishing herbs, for instance, it is used with Fu Zi, Rou Gui and Shu Di Huang. It is a common herb used for threatened abortion, vaginal bleeding during pregnancy, habitual abortion due to liver and kidney deficiency, insecurity of thoroughfare and conception vessels, because it can tonify liver and kidney, regulate and strengthen thoroughfare and conception vessels to prevent abortion. It could be used singly, or made into pill with Da Zao, or combined with herbs of tonifying liver and kidney, preventing abortion, tonifying qi, nourishing blood, for instance, it is used with Xu Duan, Tu Si Zi, and Sang Ji Sheng. For threatened abortion due to over-strain, it is combined with herbs to activate blood, nourish blood, prevent abortion, for instance, it is used with Dang Gui, Chuan Xiong, E Jiao, and Tu Si Zi. Besides, it has good action of depressing blood pressure, and is commonly used for hypertension in modern clinic. It is very indicated for hypertension of liver and kidney deficiency type, used singly or in combinations, because it can tonify liver and kidney.